The first buildings to be recognized as official Heritage Properties in Tay Valley Township’s community legacy program have been announced. 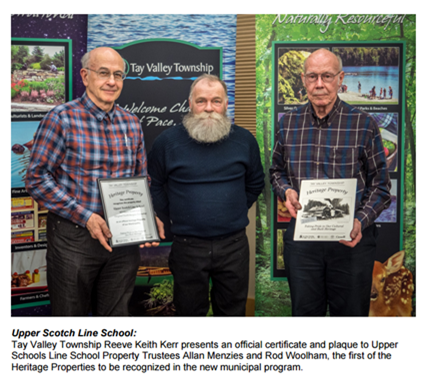 At the municipality’s Council meeting on January 30th, 2018, representatives of the Upper Scotch Line Schoolhouse property, located on the township‘s historic Upper Scotch Line, and the Balderson United church, on Fallbrook Road in the hamlet of Balderson, were presented with official recognition certificates by Reeve Keith Kerr. The Heritage Properties program is the latest in Tay Valley Township’s legacy program series that, to date has paid tribute to heritage farms, trees and cottages. In introducing the first two recipients for the new programs, Reeve Kerr noted that it responds to requests from the community, and provides a means of recognizing historically and culturally significant structures and sites not represented by these other programs. The Upper Scotch Line Schoolhouse has been recognized for its age, the quality of its classic stone construction, typical of this region in the mid-1800s, and its role in the area’s early community life. Built in 1856, the school and its nearby predecessor log and later frame schools dating from 1825, played a significant role in the development of the local community for over 140 years, from its first settlers to present-day residents. Receiving the certificate and official plaque on behalf of the Upper Scotch Line Cemetery Property Board were Trustees Allan Menzies and Rod Woolham. The Balderson United Church building has been recognized for its classic Victorian Presbyterian construction and its long role as a religious and social centre in the community. The building is characterized by its façade of area stone, interior walls and furnishings of early local woods, the imposing congregation area, and cathedral stained glass windows. The 1904 church united the Bathurst Presbyterian mission, dating from 1834, and Drummond Presbyterian mission. Receiving the official certificate on behalf of the Church were Reverend Shelley Roberts and Bill McNicol, Chair of the Board of Stewards. Tay Valley Township has announced the third historic property to be listed under the municipality’s recently launched Heritage Property Recognition Program. At the Township’s Council meeting on June 26th, 2018, an official recognition certificate and plaque were presented to the representative of the Korry/Ritchie family, Kevin Ritchie, for the family’s early heritage home and blacksmith shop in Bolingbroke hamlet. 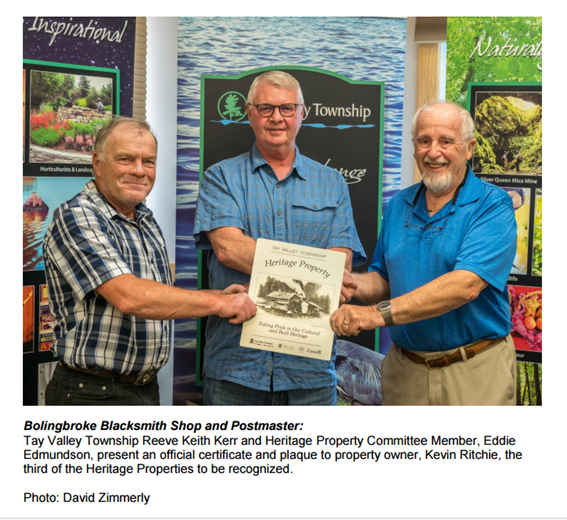 In presenting the official certificate, Reeve Keith Kerr and Committee member, Eddie Edmundson, noted that the Heritage Property Program is the latest Tay Valley Township legacy program to pay tribute to the community’s magnificent heritage along with farms, trees and cottages. The program responds to requests from the community for a means of recognizing historically and culturally significant structures and sites. The Korry/Ritchie home and blacksmith shop, located at 2740 Bolingbroke Road, has been recognized for its affiliation with these two early founding families of the hamlet, and the location of the hamlet’s first post office and an early blacksmith. The property was purchased by John Korry in 1848, from Perth military physician Alexander Thom, and has been in the Korry/Ritchie family to the present. The Korry family expanded the mill complex on the nearby Tay River into a major area industrial enterprise, of which this home and blacksmith shop would have been one of the central elements, including the post office between 1865 and 1930. The log home has been beautifully restored. The Heritage Properties program acknowledges Tay Valley Township’s long and diverse indigenous and settler history, and its wealth of heritage properties that define our community. Properties that are eligible to receive recognition under the program include buildings that have historic or cultural significance to the community, structures such as monuments, cemetery markers, bridges and heritage landscapes and archaeological sites. This program is commemorative and carries no legal restrictions for properties. For further information please visit the Municipal Office or www.tayvalleytwp.ca. The Township wishes to thank, and acknowledge the support for this program from the Canada 150 Fund and the Perth & District Community Foundation.